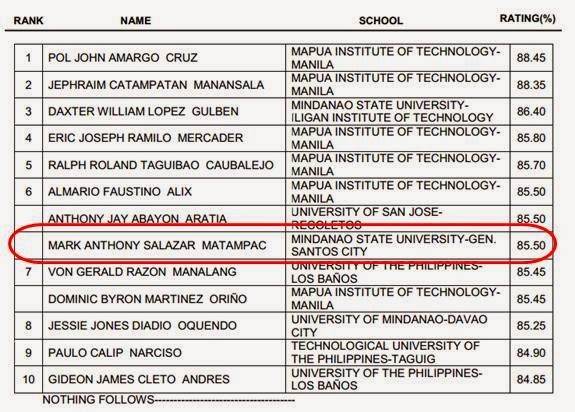 Mindanao State University General Santos (MSU-Gensan) again produced another board top notcher in Mark Anthony Matampac who placed 6th in the February 2014 Electrical Engineer Board Exam given by the Professional Regulatory Commission. Matampac who hails from General Santos City got a rating of 85.50 percent. According to PRC only 574 out of 1,648 examinees successfully passed the February 2014 Registered Electrical Engineer Licensure Examination (SEE List of Passers HERE) given last February 23 & 24 in the cities of Manila, Baguio, Cagayan De Oro, Cebu, Davao, Iloilo, Legazpi and Lucena.